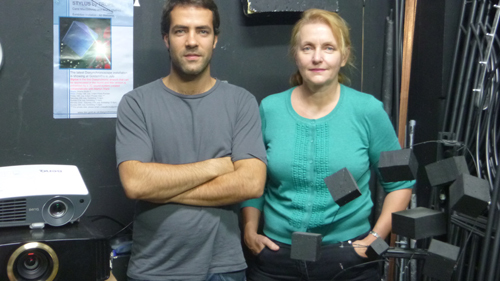 The artistic Partnership TROPE consists of Goldsmiths PhD student in Arts and Computational Technology, Carol MacGillivray and MFA alumnus Bruno Mathez. Together they have created the Diasynchronoscope – a new form of 3D concrete animation that is screen-less, allowing an immersive and embodied audiovisual experience . The name Diasynchronoscope comes from combining diachronic‚ (the study of a phenomenon as it changes through time) with synchronous and scope (view). The system draws on tropes from audio-vision, animation and Gestalt grouping to create replicable, embodied perception of real, concrete objects animated in synchronization with sound. The works combine analogue and digital in a fresh way. Uniquely, a key formalism of each Diasynchronic installation is that they are created in true hybrid partnership between sound and vision, where neither music nor visuals provide primary influential aesthetic focus. The Diasynchronoscope eschews the screen and the colour/music analogy common to many early audiovisual creations and instead adopts Kurt Schwitters paradigm of ‘Merz’; bringing every conceivable material together for artistic purposes, with each individual material (both aural and concrete) contributing to the same effect in equal part. 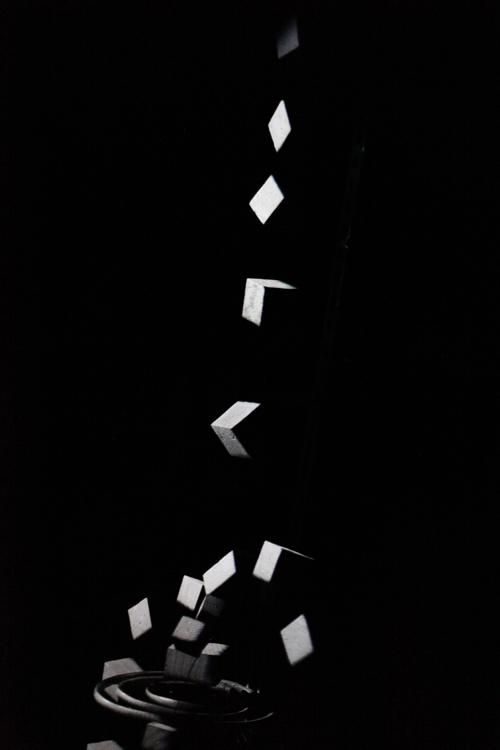 The TROPE team use their unique skills drawn from animation, music composition, sculpture and projection mapping to create ‘bonds of inevitability’ for participants that combine sculpture and sound in tandem in space-time. For the concrete objects in the Diasynchronoscope, time becomes synonymous with space: Artistic choices of synaesthetic audio, cause and effect and spatial relationships between multiple molecular objects become relevant to the changing nature of a concrete object in time, and thus the relationship between material and meaning is in continual flux – this seems to call for a fresh taxonomy in interpreting audiovisuology in a medium where time and space are intrinsically linked and the perceptions of a mobile audience influence their experience in real-space/time. The Diasynchronoscope – video presentation from Diasynchronoscope on Vimeo.